Hey everyone! Today I have a guest post for you by Jason from Winning Personal Finance. Back when I was paying off my student loans, I gave up pretty much everything haha! But since then I've definitely found that there are things in life that I just don't want to give up anymore (like boating). I think that it's really important to find a balance, and quite honestly it's probably healthier from a mental standpoint. My wife and I have always been savers. We’ve taken advantage of 401(k) and IRA accounts since starting our careers. We’ve also saved a bit outside of them putting us in a strong financial position. A few years ago, my wife and I changed our lifestyle and drastically cut our expenses so she could stay home to raise our children. The pressure of being the sole breadwinner for the first time – and having three mouths to feed – started to give me some anxiety. I realized focusing on saving was the key for me to have Less Stress and More Happiness. 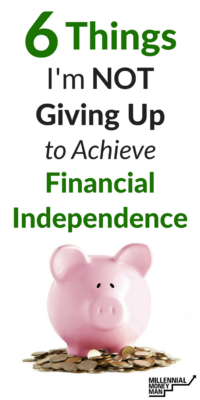 I started reading personal finance blogs and caught the Financial Independence (FI) bug hard. Learning how to calculate my FI number using the 4% rule of thumb was eye-opening. Since we’ve always been focused on saving and investing, we had a strong start. My first calculation put us about 11 years away from FI. Then I went to work. I went over our budget and spending again with a fine tooth comb to cut any remaining fat. I found some savings on the insurance and cable bills even though I failed to cut the cord. Still, we spend a lot of money each year. Partly because there are certain expenditures more important to us than cutting our time to FI. Even after all the scrubbing to our budget, some discretionary items remain. I’m a bit obsessed with skiing. When the days start to grow shorter and everybody starts complaining about the cold, my energy level picks up a step. There’s a saying that “the worst day skiing is better than the best day of almost anything else.” I couldn't agree more. There’s nothing quite like skiing a steep run with fresh powder. I spend about six months a year looking forward to my annual ski trips. Giving them up would not be pretty on my psyche. Unfortunately, many single day lift tickets top $100. It’s not a frugal hobby. To better balance our budget, I made some adjustments to our ski trips. Last season, I stayed within driving distance of home in NJ to avoid airfare and car rental expenses. This year, instead of separate trips with my friends and my wife, I’m taking one longer trip. Even though I’m flying for that one, I’ll use miles and points to keep the costs low. To save on lift tickets, I carefully choose destinations and buy season passes and/or discount cards well in advance to get the most value for my money. If you love your favorite hobby as much as I do, don’t give it up to pad your brokerage account. Figure out a way to make it work while achieving your financial goals. Spending on the things that make you happiest is a fundamental principle of Winning Personal Finance. I have two boys under the age of four. The younger one isn’t quite ready for anything other than the basic functions of ESP (eat, sleep and…you know the rest). Our older son has been enrolled in various activities since he’s very young. We enrolled him in music classes when he was just a few months old. Even as a baby, you could tell that it soothed him. A few years later, my son is already starting to keep a beat and is always grabbing his microphone to put on a show. We enrolled him in swim lessons for safety. Knowing my kid can swim will give both me and his mom peace of mind when around water. My son has been in gym class since he first started walking. It has been fantastic for his socialization, patience, balance, sense of adventure and confidence on his feet. A local park runs some inexpensive classes that teach kids about the animals and plants in our area. Anything I can do to get my kids excited to learn about nature is good by me. We participate in plenty of free activities, too. We go for walks, bike rides, enjoy a playground, take free Home Depot workshops along with other community events. Yes, you can have great experiences for free. Still, the paid activities above are worth working a bit of extra work to me. When I think back on the highlights of my life, the top ones are obvious. My wife agreeing to marry me. The quiet moments holding my newborn children. Once we get past those, the rest of my list is mostly travel related. As a child, I remember the beauty of Yosemite National Park and my first experience skiing powder in Lake Tahoe after an epic snowstorm. As an adult, I’ve hiked in Hawaii, went ziplining in Costa Rica, ate amazing food in Paris, visited Mickey in Florida and partied in New Orleans. I’ve also skied in Zermatt, Chamonix, Colorado, Utah, Wyoming, Lake Tahoe, British Columbia and all over the Northeast. Did I mention I love skiing? If you really want to get me talking, ask me about any of the trips above. They were all amazing and memorable in their own way. Those experiences are well worth the dollars spent. While we always consider the cost and relative value when we book travel, the line in our budget will always be there. Even though I’ve been failing at this one lately, I’m adding it to this list because of its importance. In what seems like a lifetime ago, I ran two marathons, a handful of challenging obstacle course races and more shorter races than I can count. Additionally, back in our dual income days, my wife and I hired a personal trainer to come to our apartment and force some physical fitness on us. We were in the best shape of our lives at the time. When we cut our budget so my wife could stay home and raise our son, the personal trainer and races went by the wayside. So did my physical fitness. One of my 2018 goals is to run a half marathon. Signing up for a race will give me the motivation to get out and train. I’ll get a solid return on my race fee investment. With two children, one full-time job and one blog keeping us occupied, quality time with my wife is more cherished now than ever before. We are lucky to have our parents who offer to babysit nearby. When they do, we take advantage of their help to have a date night. Whether it’s dinner and a movie, bowling or something else, the activity really doesn’t matter. It’s great to just get out for a bit together. I’ll never give that time up even if our dates cost a few bucks. Our date nights have gotten less expensive lately. In our dual income no kids days we may have spent a Saturday night in a high-end wine bar or celebrating the latest accomplishment with a steak from Del Frisco’s in New York. While those expensive meals are not completely out of the question today, they are very rare. I find that the quality/cost of the restaurant we patronize does not matter nearly as much as the company. One of the largest cost savings realized when my wife left her job to stay home with our children was no longer having to pay for daycare. The cost of our old daycare was closer to a mortgage payment than a car payment and eliminating the bill was a relief. One short year later, it was time for my older son to start preschool. That may work for horseshoes or a pass/fail exam. It does not work for parenting. Our children will benefit from preschool, so we’re going to send them no matter the cost. Thankfully, half-day preschool is still much less expensive than full-day daycare. Last but not least, is the more expensive education: college. I chose to attend an in-state college to keep my costs reasonable. I also was fortunate that my parents could foot the bill. I am where I am today because of my education, and my savings were greatly boosted because I didn’t have to pay for it myself. I’m saving to give my children the same benefit. I don’t feel like my parenting obligations will be complete without giving my sons the same advantages in life that I had. So, if I have to work a little longer or harder to reach my college savings goal, I plan to do so. Anybody who has read a FIRE (financially independent, retire early) blog has imagined how awesome it would be to have enough of a nest egg that you don’t need to work to fund your needs. I’m super excited for that milestone. I’m going to save and invest and get to FI…when I get there. It’s not a race. Sure, I have a target date. In an ideal world, I’ll shave off years to FI by saving more than I planned and having my investments exceed projections. If life intervenes, maybe I get there a little later. No matter what, I’m not planning to give up the items above to win a non-existent race. I strongly believe that chasing financial independence is about prioritization, intentionality, and focus – not sacrifice. What hobby will you never give up to save money? You sound like a younger me, keep that skiing up. I’m a boomer and I just booked a week next month in Breck with my wife, ski in ski out condo. I was shocked that I didn’t qualify for a senior rates up there when I qualified for senior status as a team tennis player at 50! You have great balance in your list of must do’s. I would however keep an open mind on college. Some degrees are a huge waste of time and money and I think traditional degrees in many fields are going to be replaced with some version of online education or apprenticeship. My chemical engineering degree earned me a lot of money and some outrageously fun work but I’m not sure a liberal arts degree will be worth the paper it is printed on in 15 years. Or maybe it will be. I love Breck. Have fun! The key to getting value at Vail resorts is to buy a season pass and get a bunch of days in. When you are paying for day tickets, it gets very expensive quickly. You’re right about college. I’m not planning to write a blank check for it. I always have and always will shop based on value. I chose my degree in a field that had great job opportunities. If the path to a good career is different when my kids are ready, I’ll support them however it makes sense. My point in adding “college” to the post was that a) I’m saving for it b) I’m not going to FIRE and leave my kids to take out thousands in student loans to get the education they need for a career. I would never give up investments in physical fitness which include my many outdoor hobbies – cycling, climbing, snowboarding, and paddleboarding. They’re all expensive at some level but well worth it. I went paddle boarding for the first time last summer. I put my son on the front of the board too. He loved it. What a fun way to get a workout! Yes! I find the extremism in the personal finance community can be a major obstacle for the average person to overcome. Most people simply are not willing to live a deprived life so they can stop working someday. Delayed gratification works better when you aren’t delaying ALL of the gratification. For me I refuse to give up my martial arts gym membership and organic foods! Love this quote “Delayed gratification works better when you aren’t delaying ALL of the gratification.” That’s exactly how I feel. The goal is to find a true balance between living for now and planning for the future. If you focus 100% on either, you may have regrets down the line. I’m with you. Saving is HUGELY important, but it shouldn’t mean a boring life. All the things you share are totally worth spending money on. It’s what makes life fun! I love concerts too. I used to go to a ton of them. I’ve cut down the number of live shows I attend quite a bit the last few years though. Having kids and needing to coordinate babysitters for late nights is tough so I only go to the one or two shows a year that are most important to me now. It’s nice to see someone who is considering the larger picture. There is so much undue pressure in the FI, FIRE, and financial blogging community to race to the finish line as fast as you can and sacrifice everything in the meantime. You should enjoy all parts of your life. Today is a part that you should be enjoying first because there is no guarantee of a tomorrow. On top of that, it is not like your life is suddenly amazing, perfect, fixed, whatever you think it will be once you reach FI or retire early. It is still the life it was the day before more or less. People need to spend more time enjoying their life in the moment, as the author states. You are still the same person the day before you retire as the day you are retired. Remember that. Thaks for the compliments Alex. I see myself as a FI blogger, not a FIRE blogger. My goal is to become FI as quickly as I can while enjoying my life and not making major sacrifices along the way. You can’t have it all but you can focus your life to have what’s most important to you. I try to focus my site on financial decisions. Sometimes those decisions lead to spending more and sometimes spending less is required to reach one’s goals. My absolute favorite situations are when you can get the value wanted without making a sacrifice by being strategic. This can be done with things like tax planning and investment strategy or even something simple like aggressively shopping for a good deal.